On his final pass Drew Brees connected with Darren Sproles for a 9-yard touchdown, and broke Dan Marino’s single season record for most passing yards. 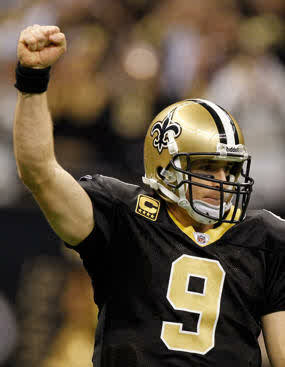 The New Orleans Saints continued their hot streak destroying the Atlanta Falcons 45-16 on Monday Night Football. The victory clinched the NFC South for the Saints but the story of the night was Drew Brees’ record breaking performance. Brees passed for 307 yards, 4 touchdowns and 2 interceptions. It was Brees’ final two yards and touchdown that knocked Marino’s 27 year record out of the record books. Marques Colston was Brees top target catching 7 passes for 81 yards and a touchdown. Robert Meachem added 75 yards and a touchdown. Matt Ryan led the Falcons with 373 passing yards and a touchdown. Julio Jones caught 8 passes for 128 yards and a touchdown while Roddy White had 11 receptions for 127 yards.